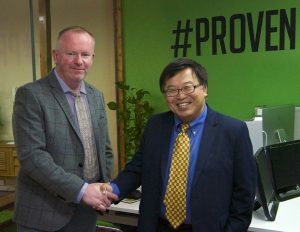 The team here at Formation Media always enjoy networking and meeting with other industry professionals and this week, we had a very prestigious visitor; Stanley Yu, Director of Sales and Marketing at Hardinge, Taiwan. After a 10-day tour of Europe, visiting key Hardinge accounts and distributors, Stanley decided to spend his last day in the UK with the Formation Media team, before returning home to Taiwan. Hardinge Incorporated is based in New York and is one of the longest established global CNC manufacturers on the planet. The company has a very loyal base of UK clients within the manufacturer sector and is known as Bridgeport Hardinge within the UK. Over the past twelve months, we at Formation have been working closely with Hardinge to develop a bespoke software system that will enable their USA and Taiwan production facilities to communicate with all their European distributors. Whereas in the past, language barriers, time zones and other issues posed problems for the company, thanks to the new software, these problems have all been resolved, allowing for effective mass communication. Our team of talented software developers have been busy designing and developing this bespoke dashboard, which allows Hardinge to manage communications and global administration from this single portal. This not only prevents communication issues but also makes it a more efficient and straightforward process. The reason for Stanley’s visit to Formation Media in Warwick was to review the completed system that our software team has developed. After many months working to complete the project, we are thrilled to have Stanley’s seal of approval. The dashboard is now ready to go live, and we look forward to developing their European website and supporting this global client. Over the years, Formation Media has built up an enviable reputation for its quality web design and digital marketing services. Working with a wide range of clients including Warwickshire Police & Crime Commissioner, Warwickshire County Council and the prestigious Banana Moon franchise, we have developed an outstanding portfolio, featuring over three hundred projects. More recently, we have expanded our services and now offer bespoke software development to local, national and international clients. We cater for large-scale projects that require a high level of interaction between our clients and their own customers. All of our software developments are built with usability in mind and come with intuitive functionality, making your platform easy to use and manage. Whether you are looking for a way to organise your employees, activities and jobs, need to manage your franchises more efficiently or require a way of tracking visitors coming to your event, we can deliver the perfect digital solution to meet your needs. Our software developers will work closely with you to ensure you get the most out of your new platform and that it is tailored to your requirements. We’ll go above and beyond to ensure you are provided with the ultimate development service. If like Hardinge, you require a bespoke piece of software or an entire digital system, we welcome you to get in touch and see what we have to offer. If you’re looking to work with an innovative and dedicated team of developers, we at Formation Media are #Proven and have the intention to Double your Business Turnover, please ask us how?